I am Habib from Herat, Afghanistan. I love Afghani and Persian traditional foods and I found it very interesting when my elders would talk to me about the different kind of foods we ate for different seasons. I thought of food when I joined the army in Afghanistan, and especially when I was in missions and military operations far away from home. When we were in the desert or mountains we didn’t eat proper foods, mostly eating frozen foods or ready-made meals. Then one day I decided to try and cook my favourite fresh dishes, and after a few times, I managed to cook well and I liked it. Then I started to cook for the others as well and they were very happy about that. Then I started cooking for my family. 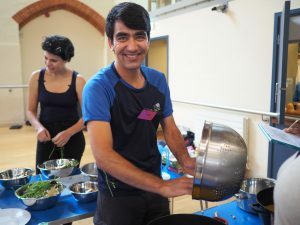 My cookery experience was useful and helpful during my journey to Europe as well. I used to cook for myself and other refugees in the Calais jungle. I love cooking and sharing the foods with the others and I love when people smile when they eat my food!